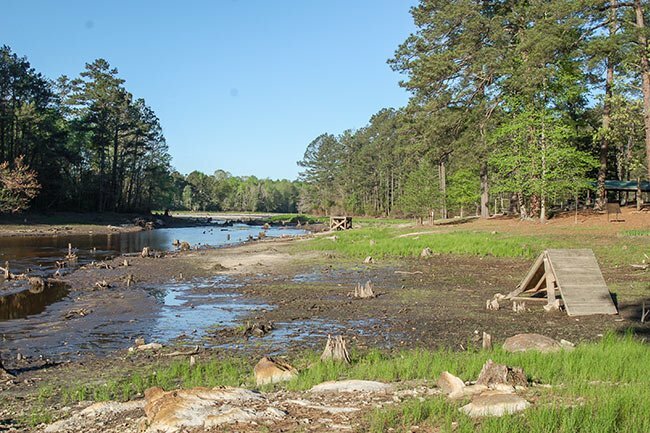 This swimming hole in historic Gibson Pond Park was long a favorite among Lexington County residents, helping them escape the hot South Carolina summers for nearly 40 years. Formerly known as George’s Pond, this property was purchased in 1934 by Murray Gibson and transformed into a popular recreation area. 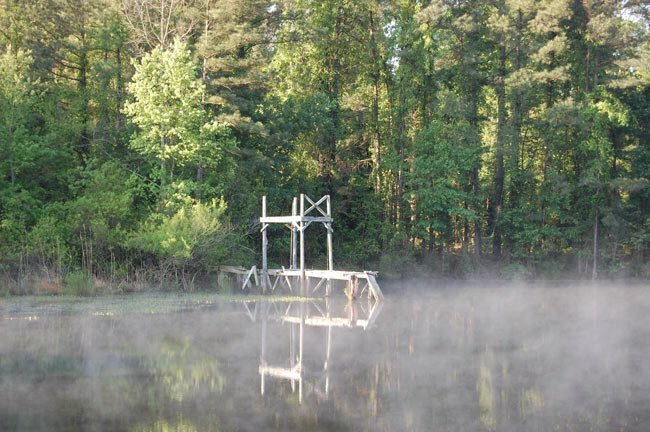 In addition to the diving platform pictured above, Gibson also added a pavilion, picnic tables, and rental cabins. The park closed in 1972 but was reopened to the public in 2007 with several major additions including a scenic overlook, which provides a unique view of a waterfall rushing over an old gristmill. It is now operated by the Town of Lexington and includes a large picnic shelter, a paved trail, restrooms, and a fishing pier (swimming is no longer allowed). On October 4, 2015, South Carolina was devastated by massive flooding throughout the state. 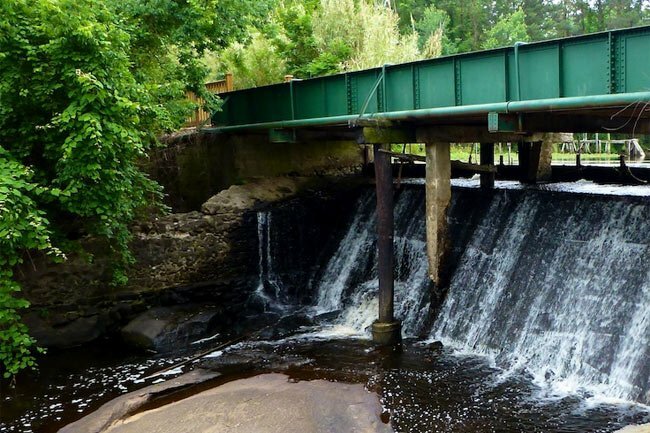 During this flood, the pond’s dam broke, causing the water to release and flood the area below it, including the mill pond and the old textile mill complex. The Town of Lexington worked to rebuild the dam, refill the pond, and reopen the site to the public. The park remained under renovation and closed to the public for a little over two years. Damages from the flood can be seen above. As of early 2018, the park has undergone renovations and is reopened to the public. Could you send me a picture of the pavilion by email? I saw a large picture in the Lexington Court House and liked it, however, I couldn’t find it on line. Thanks so much for the information and update! This Park is now open. It was an extremely popular destination in the 1940s-1970s. There was a dance floor on top and many young soldiers came from Ft. Jackson to have fun and meet the young girls from the area. As a child, I walked from my house with my friends to swim there in the 1950s and early 60s. The swimming hole is/was on private property. It was owned by a friend of mine’s family when we were kids. At one time they maintained a sandy beach there. It was long gone and overgrown well before the flood of 2015. Where is the secret swimming hole exactly? Just wondering. I have been metal detecting the spot since the dam busted in the area of the dam and old dock. I have amassed a huge amount of relics, coins and jewelry. Numerous ID bracelets that I plan to return to families. Tons of Lexington history. I grew up on a road right next to the pond. As a child in the late 1980s my friends and I had lots of fun exploring the mill, cabins, and banquet hall. Back then, the mill wheel was still intact and turning. We also had our own secret swimming hole further up the pond. Are there alligators in this pond? I have seen the signs that state ‘no swimming’ and have become concerned for my pups. Where online can I find the 1957 photos of the dance pavilion? As a child I swam at Gibson Pond at least twice weekly. Lots of fun. I am 60 now and back then they even had swing sets that were set into the pond.